When the rainbow flags go up along Market Street, you know its June in San Francisco and the count-down (so to speak) begins as the city amps up for one of the largest and well-known Pride events in the world: the San Francisco Pride Celebration, as festivities begin Saturday, June 28th culminating to Sunday, June 29th with the world renowned San Francisco Pride Parade. DEM also gets to be a part of Pride as we join our fellow city agencies and parade organizers in our activated Emergency Operations Center (EOC) as we support event operations and coordinate city resources. Our EOC will be activated at a level B so we have all the right people in the room. A level B activation includes Department of Emergency Management staff, first responder elements, and other key departments. In the case of SF Pride, this includes the Police Department, Fire Department, ambulance providers, MTA, and parade organizers. 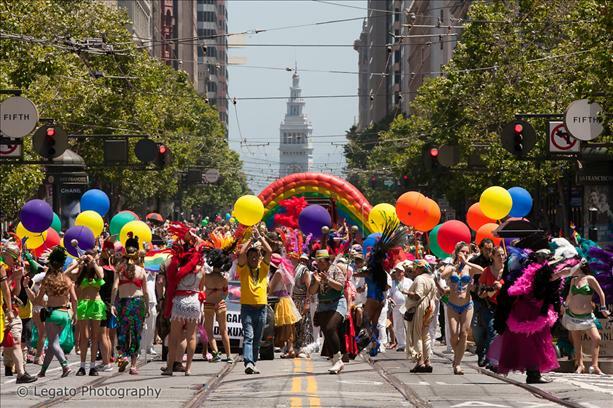 We also will provide information to San Francisco about traffic and transit, as well as any other tips that the public needs to know about as the city celebrates Pride. Why are we activating our Emergency Operations Center? San Francisco routinely activates our EOC for citywide special events like New Year’s Eve, Bay to Breakers, and past and future San Francisco Giants World Series Championships. This allows us to support event operations, coordinate city resources, and provide public information. EOC activations also give us an opportunity to practice for unplanned events and not-so-everyday emergencies like earthquakes. What to look for from DEM. One of our main priorities in support of San Francisco Pride is to provide the public with important information about the race (e.g., transit and traffic notifications). We will push out this information on our SF72 Crisis Map and on @SF_Emergency. And to kick off the public information, check out SF72’s crisis map with important parade information. The mission of San Francisco LGBT Pride is to educate the world, celebrate our culture, commemorate our heritage, and liberate our people. 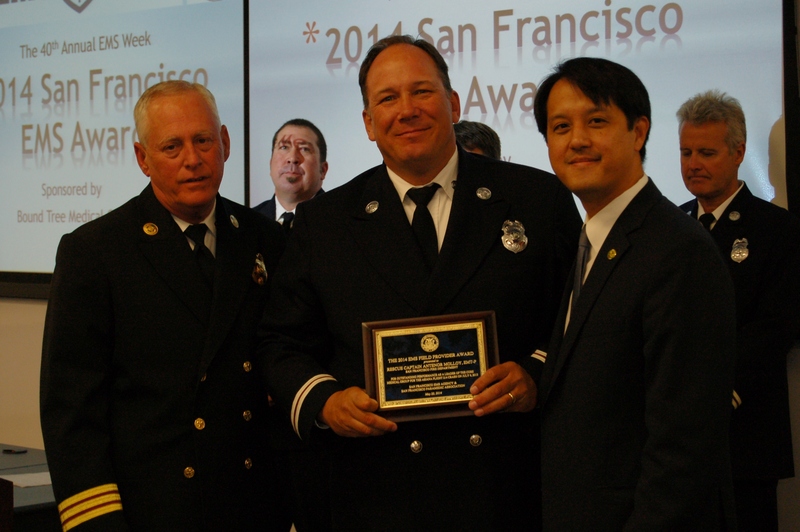 And the San Francisco Department of Emergency Management is proud to play a role in support of this mission. It is a cool, overcast morning in San Francisco. It’s been a wet month with rainfall reaching record levels leaving the ground waterlogged. It’s also Spring Break which means there are thousands of people enjoying themselves along the Embarcadero, Marina, and beaches despite the clouds. At 8:00 a.m. a magnitude 9.1 earthquake occurs off the coast of Alaska. Within 5 minutes of the underwater tremor, San Francisco receives an alert from the National Oceanic and Atmospheric Administration (NOAA). NOAA has just declared a Tsunami Watch for the entire west coast of the United States. A tsunami could arrive in San Francisco within four to six hours. Sound like a good action flick? We’ll save you the time it takes to search IMDB or Google. 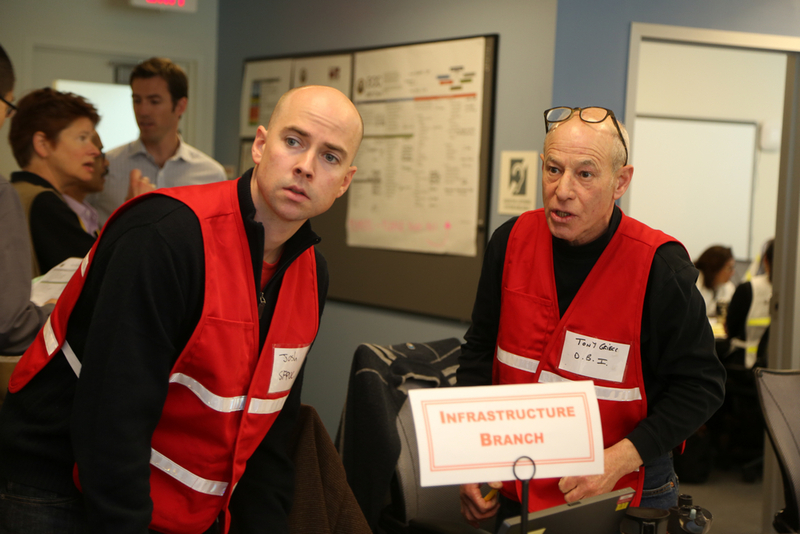 This was the scenario put before dozens of emergency managers, community partners, and local, state, and federal officials during San Francisco’s three-day tsunami exercise in March. The goals of the exercise were to practice our City’s alert and warning procedures, response capabilities, and recovery operations before, during, and after a tsunami. Great question. San Francisco plans and prepares for all emergencies. Since 1850, over fifty tsunamis have been recorded or observed in the San Francisco Bay. The most recent event was during the 2011 Tohoku Earthquake and Tsunami, which registered three to four foot waves in parts of the bay and resulted in approximately $100 million in damage statewide. 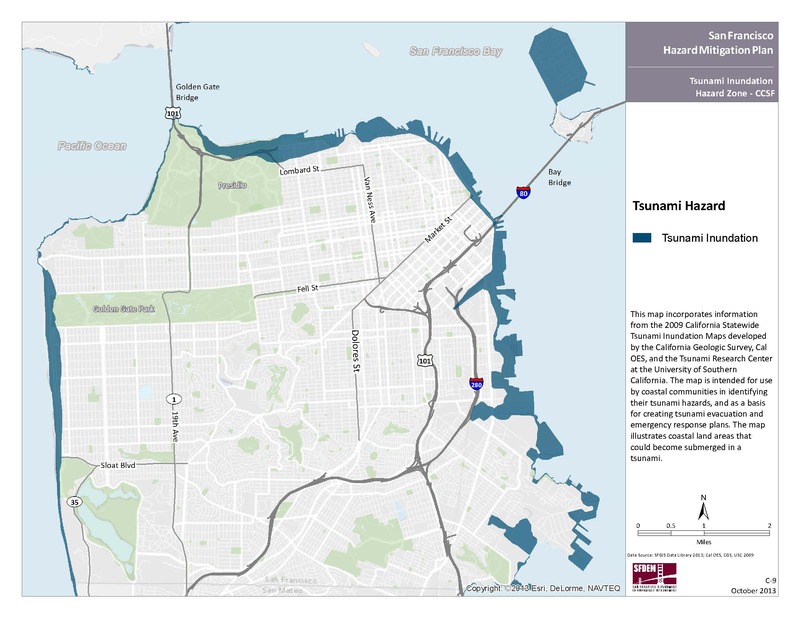 San Francisco’s tsunami risk includes neighborhoods along both the ocean and the bay. We’re fortunate that our risk for a local source tsunami, where we don’t receive much warning, is low. What is possible is a distant source tsunami. An example is an earthquake, landslide, or other seismic event that takes place off the coast of Alaska. In this scenario, a tsunami could reach San Francisco in 4 to 6 hours. Move inland and head to higher ground during a tsunami. 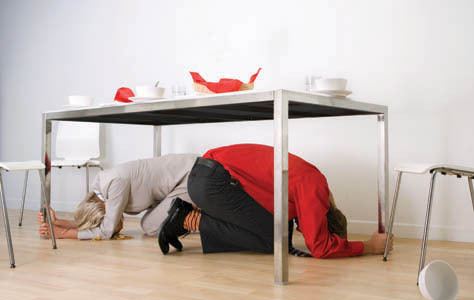 If you are in a coastal area and feel an earthquake with strong shaking lasting a minute or more, drop, cover, and hold on until the shaking stops, then move immediately to higher ground. Always wait for local authorities to tell you when it is safe to return to affected areas. To learn more about how San Francisco plans and trains for all emergencies visit www.sfdem.org. For easy to use guides on how you can prepare visit www.sf72.org. EOC staff review public messages prior to a press conference. Photo by Michael Mustacchi. Keeping track of logistics is also also critical during an emergency. Photo by Michael Mustacchi. DEM Staff with Mayor Edwin M. Lee. L to R: Executive Director Anne Kronenberg, Exercise Coordinator Doris Padilla, DEM Policy and Planning Manager Amiee Alden, Mayor Edwin M. Lee, DEM Assistant Deputy Director Bijan Karimi, Lead Exercise and Training Coordinator Jill Raycroft, Assistant to the Executive Director David Ebarle, Public Information Officer Francis Zamora. Photo by Michael Mustacchi. Finance staff must keep track of how much is spent during an emergency response effort. Photo by Michael Mustacchi. emergency or are in crisis. Every month a DEM Public Safety Dispatcher (PSD) is recognized for outstanding service while assisting those in crisis. The following DEM PSDs are the Spring 2014 Dispatchers of the Month, for the compelling reasons described below. On January 30, 2014 while operating a radio channel, PSD Shaw heard two officers speaking discreetly. She immediately asked if there was an emergency. Shortly after, an officer advised that a vehicle was absconding from him. As he began to report the license plate he yelled “Oh! … he’s resisting … we have a 518 (Roll Over),” and requested two ambulances to respond. This incident began to escalate quickly. The Bayview sergeant requested more units to respond to the scene. PSD Shaw broadcasted the 10-25 status (Request Backup Needed), and swiftly began adding and assigning units to respond accordingly. This event became highly charged but PSD Shaw did not falter. She maintained complete channel control while assigning someone to block intersections, broadcast safe avenue of approach, and direct a unit to recover a discarded bag of drugs. PSD Shaw — along with her channel partners — was able diffuse this incident in a timely manner. She was professional, calm, and poised throughout. On February 8, 2014 while off duty PSD Solis viewed a pedestrian who had been struck by a vehicle. He immediately rendered aide and remained with the patient until paramedics arrived on scene. The patient was transported with head injuries. PSD Solis is being recognized his professionalism and caring act of kindness. He went beyond the call of duty. On April 25, 2014 while working a fire control channel PSD Juarez received a call reporting smoke coming from a roof top. Moments later another call was received regarding visible smoke coming from a residential structure. Totally unrelated to the other calls, a third call was received with a report of flames coming from a home with persons evacuating. It is uncommon to receive three working fires, let alone within such a short time frame. Regardless, PSD Juarez took complete control while using all available resources to achieve results. Her actions were nothing short of remarkable as she displayed confidence and remained focused throughout the process. Fortunately, all fires were contained and under control within 30 minutes with no reported injuries or medical transports. 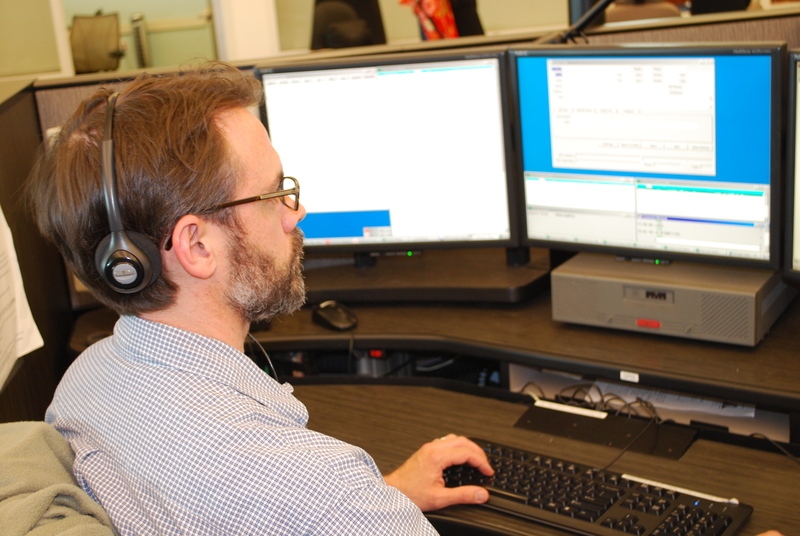 The recent launch of the new Computer Aided Dispatch (CAD) System involved a tremendous amount of planning and preparation and each of the aforementioned PSDs is recognized for the extra effort and valuable contributions made during initial and ongoing training of fellow dispatchers. The upgrade has involved rigorous training and testing, yet each PSD continues to put forth great efforts. Their positive and helpful attitudes are a powerful asset to the Department of Emergency Management as we keep abreast of changing and emerging technology. After 14 Years, New Radios at Last! Where were you in the year 2000? It’s been awhile. Bill Clinton was President and Willie Brown was Mayor of San Francisco. “American Beauty” won the best picture Oscar, while the hit by Santana and Rob Thomas, “Smooth”, edged out Ricky Martin’s “Livin’ La Vida Loca” for a Grammy. Facebook and Twitter didn’t exist. Have you improved and upgraded over the last 14 years? You probably have. But the radios used by San Francisco Police, Fire, and other public safety agencies haven’t. Seriously. 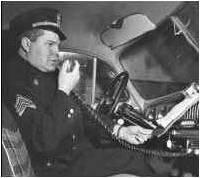 In a digital world, the City’s 7,500 public safety radios operate on a 14-year-old analog system, first installed in the year 2000. Who thinks it’s time for an upgrade? We do. In partnership with the Police and Fire departments and the Department of Technology, DEM is proud to lead the charge to upgrade the City’s 800 MHz Public Safety Land Mobile Radio System. It provides life-safety radio communications for San Francisco’s Police, Fire, Sheriff, Parking and Traffic, Recreation and Park, and Emergency Management (that’s us) departments. 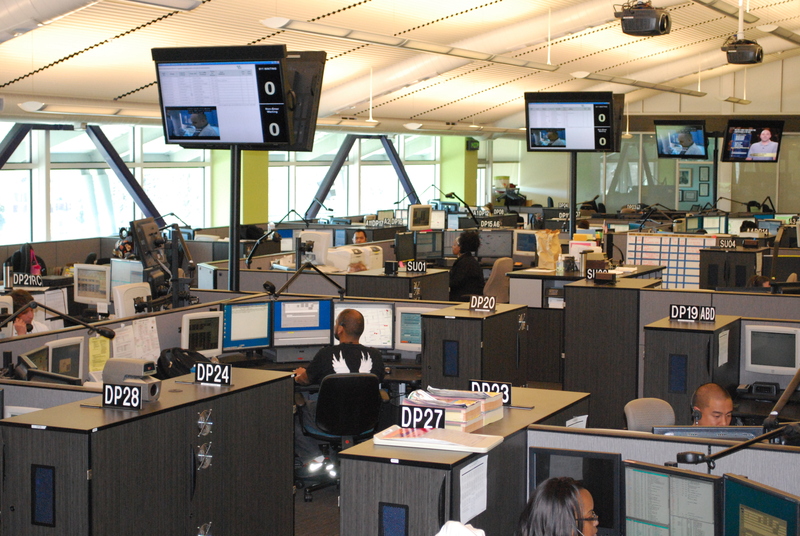 This means critical push-to-talk communications that connects instantly with the 9-1-1 dispatch center for dispatch to emergencies, or calling for backup from other officers in the field. The system uses proprietary analog technology that has now reached end of life, with no replacement parts available. Last month we received the City’s approval – and critical funding – to finally replace this aging system with current technology. The new radios will be interoperable across the Bay Area, so when a San Francisco police officer goes over to Oakland, her radio will still work. The system will also provide better coverage, like underground in BART stations, as well as down to the Airport. We estimate that a full system replacement should be complete by mid-2018. So just as Y2K babies will finally graduate and leave home, we’ll say goodbye to our Year 2000 radio system, and upgrade to the future. It’s about time. 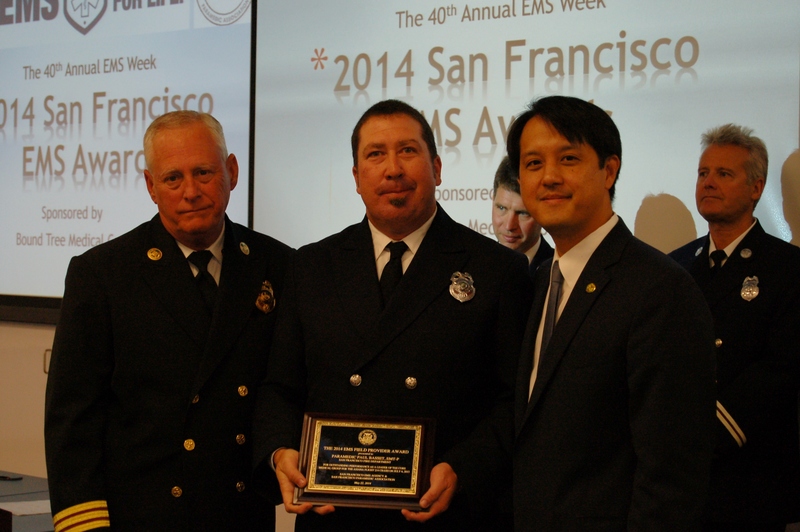 San Francisco Department of Emergency Management’s (DEM) Emergency Medical Services Agency (EMSA) is made up of incredibly smart and caring individuals who are dedicated to saving lives. For DEM, being able recognize those who go above and beyond is a real honor. This year marks the 16th Annual EMSA Awards Ceremony, and awards were presented to outstanding individuals for their commitment to emergency medical care. 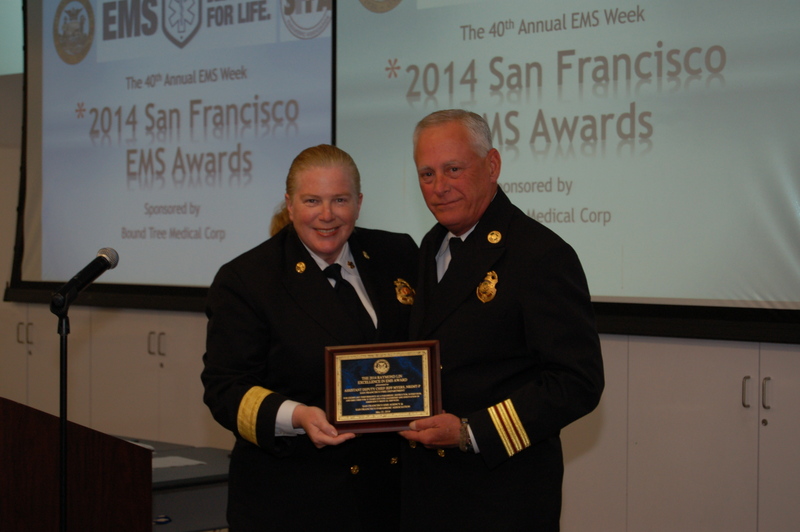 Assistant Deputy Chief Jeff Myers for exceptional performance as a paramedic, instructor, supervisor, and EMS Chief for 33 years and for leadership and innovation in emergency medical services. 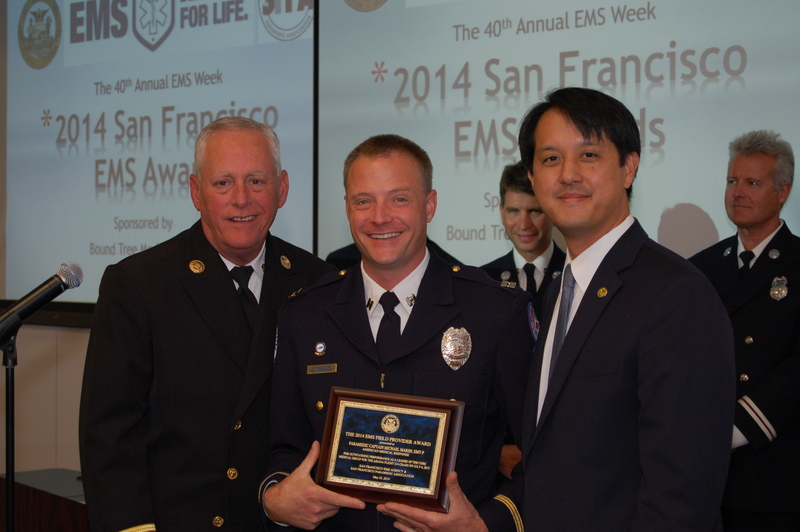 San Francisco Fire Department Chief Hayes-White presenting the Raymond Lim Excellence in EMS award to San Francisco Fire Department Assistant Deputy Chief Jeff Myers. From the late 1960s until his death in 2001, Raymond Lim was one of the most significant pioneers and innovators in the development of emergency medical services systems in California. Ray was the Vice President and General Manager of the King-American Ambulance Company in San Francisco. Ray’s contributions were enormous. Gov. Jerry Brown appointed him to the State EMS Commission from which he played a major role in drafting the Bronzan Act establishing the current EMS structure in California. He also served on the California Ambulance Association, the San Francisco Emergency Medical Care Committee, the American Trauma Society, the San Francisco Ambulance Association, the San Francisco Medical Society’s Committee on Emergency Medical Care, and the ABAG Regional EMS Council. Ray was most proud of developing the first Neonatal Intensive Care Transport Service in the United States, and the first MICN training program in San Francisco. 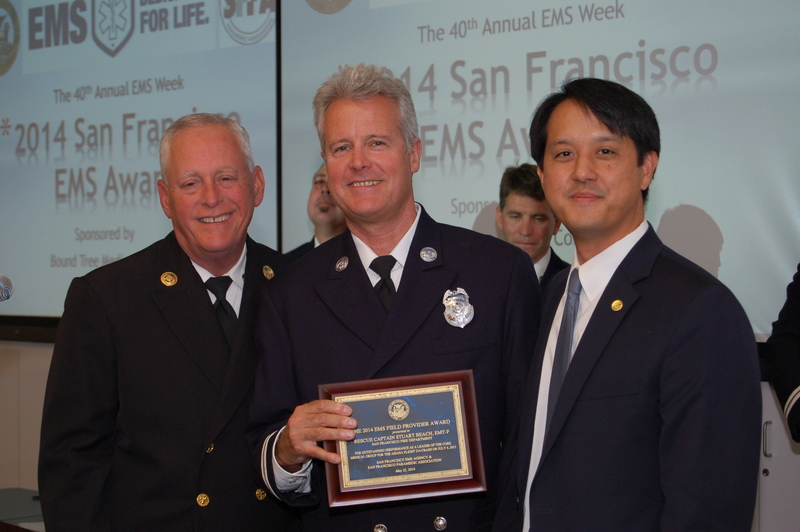 In recognition of his lifetime of dedication and spirit, the inaugural Raymond Lim Excellence in EMS Award was established. Award was presented posthumously to Raymond Lim in June, 2001. Maculata Acevez for outstanding performance as a public safety dispatcher for the past four years, and effective management of a recent family crisis resulting in caring for a dying patient, and the compassion she showed the patients’ family members. DEM Division of Emergency Communications Deputy Director Rob Smuts presenting the EMS Dispatcher Award to Maculata Acevez. 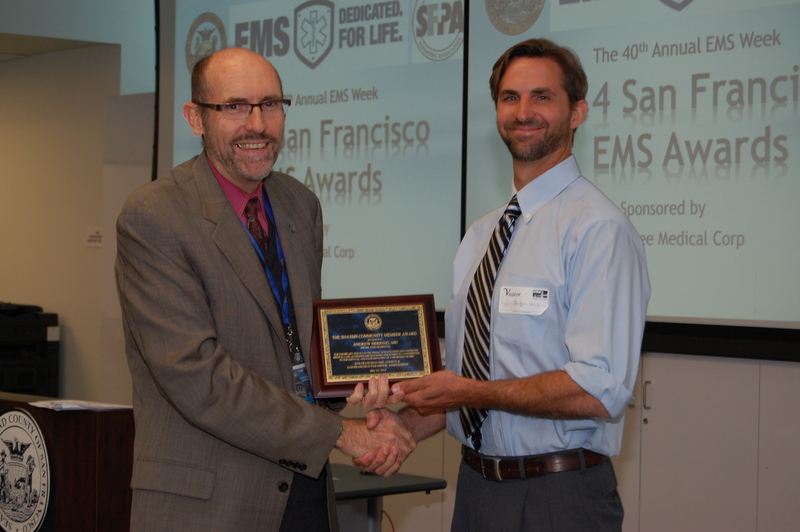 Andrew Herring, MD, for exemplary service in the initial resuscitation and continued medical care alongside EMS providers of a 33 year-old male, whom he found while surfing on Ocean Beach. Thanks to Dr. Herring’s medical intervention, the man survived and was discharged from the hospital two days later without any respiratory distress. 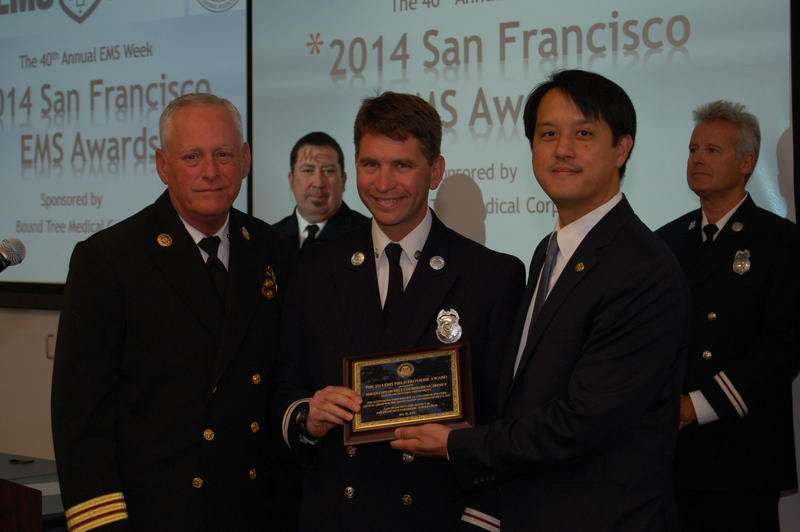 Dr. John Brown, EMS Agency, presenting the EMS Community Services Award to Dr. Andrew Herring. 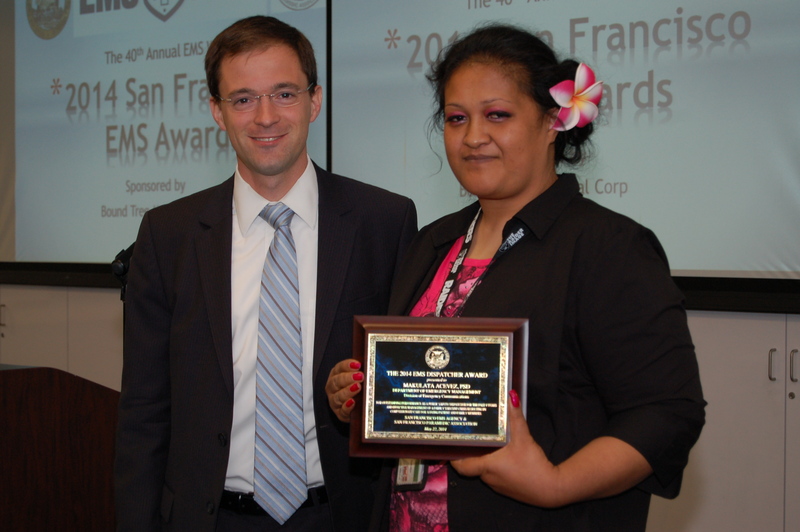 Mary Mercer, MD, for outstanding leadership in medical oversight and direction of the San Francisco General Hospital Base Hospital and Community CPR Consortium. 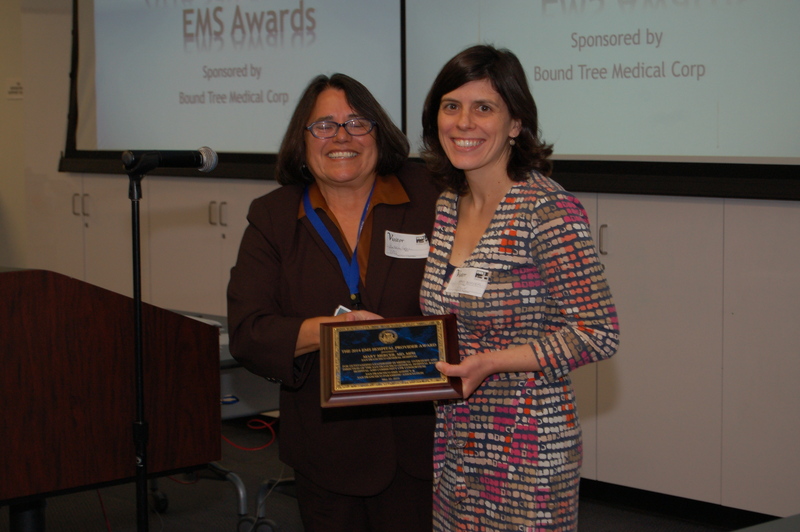 Barbara Garcia, San Francisco Department of Public Health Director, presenting the EMS Hospital Provider Award to Dr. Mary Mercer. Stuart Beach, Michael Marsh, Tony Molloy, Niels Tangherlini, and Paul Basset for outstanding performance as leaders of the core medical group of the Asiana Flight 214 crash on July 6, 2013. Paramedic Paul Bassett accepting his award. Rescue Captain Niels Tangherlini accepting his award. Rescue Captain Tony Molloy accepting his award. Paramedic Captain Michael Marsh accepting his award. Rescue Captain Stuart Beach accepting his award. Last week a 6.9 magnitude earthquake shook northern Greece and Western Turkey. The quake caused 266 injuries–mostly resulting from people rushing out of buildings. So, we’re going to get up on our soap box (or under it, should the earth move) and remind everyone what to do during an earthquake. Fight the urge to run (and that includes running to get in a doorway!). Try to get next to an interior wall, away from windows, and drop (think: I’m not going to run any where because that’s how I can get hit by flying objects or get knocked over). Make yourself as small as possible (think: I need to curl up into a ball to protect my vital organs). Hold on your head (think: I need to protect my head from getting hit by falling objects).